Paulist President Eric Andrews (left); Michael Cruickshank CSP; Paolo Puccini, CSP; Evan Cummings, CSP; Daniel Arthur, CSP; and Paulist Novicemaster Father Rich Colgan gather for a photo op after the Mass during which the four men made their first promise with the Paulist community. What do two financial advisors, a mechanical engineer and a philosophy graduate have in common? No, you don’t have to wait for the punch line of a bad joke. Rather, it is a cause for celebration. 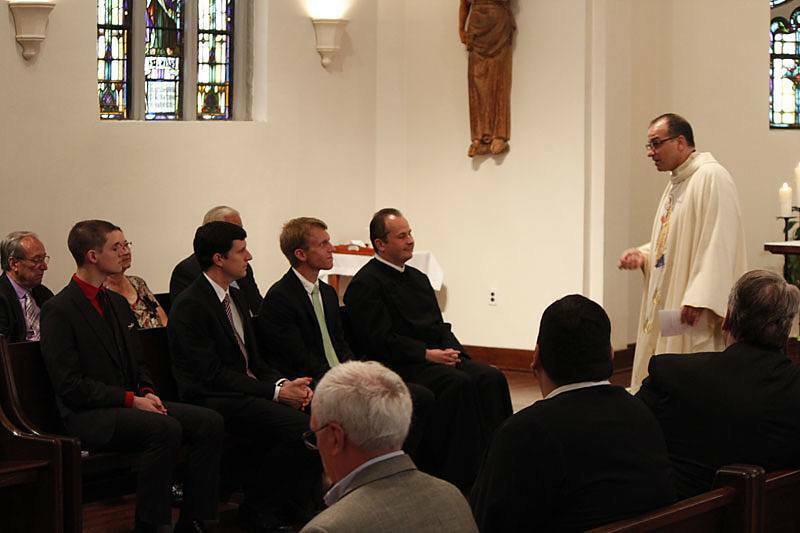 Four men – Daniel Arthur, Michael Cruickshank, Evan Cummings and Paolo Puccini – made their first promise with the Paulist Fathers during a July 26 Mass in the chapel of St. Paul’s College in Washington, D.C.
After spending a year as Paulist novices, the four men promised to live for the next 12 months according to the society’s constitution as they begin academic studies for the priesthood at The Catholic University of America in Washington, D.C., and continue their Paulist formation. 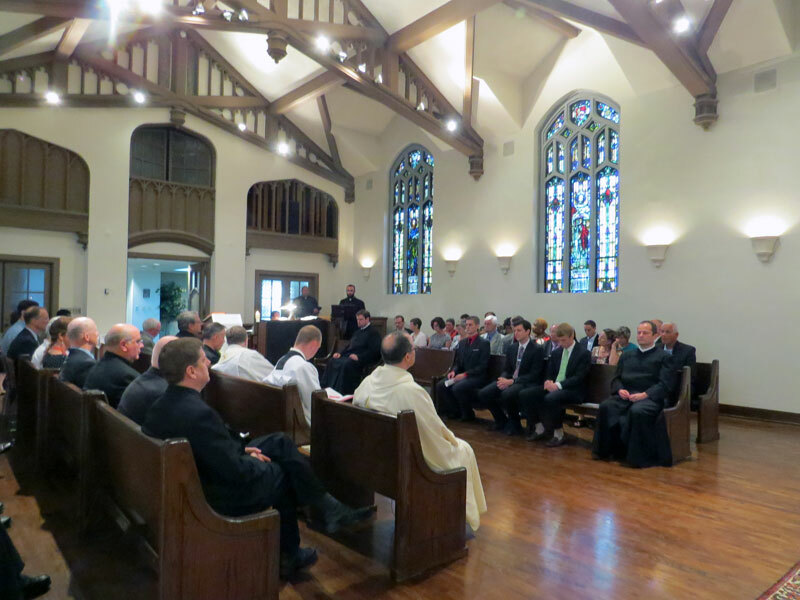 The men will renew this promise promise each year, making a final, lifetime promise in with the Paulists the fall before their priestly ordination. Paulist President Father Eric Andrews, who celebrated the Mass, said he is incredibly proud of the four new Paulists. 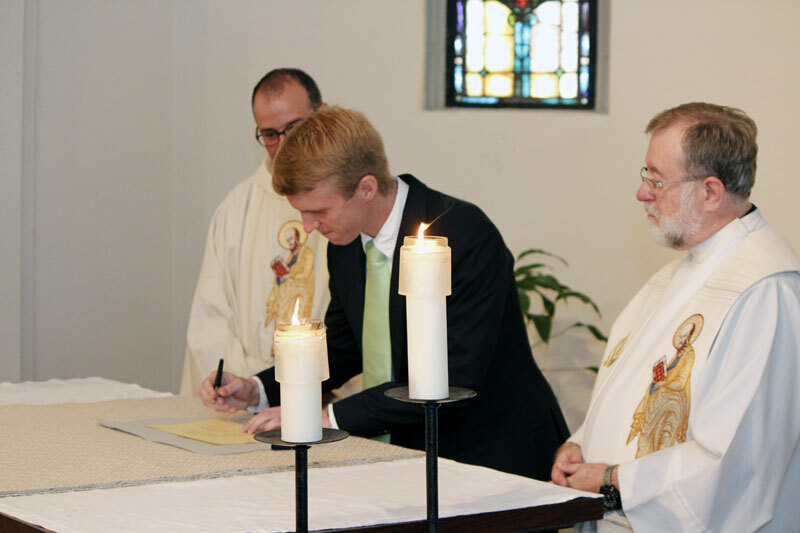 Daniel Arthur, CSP, signs the book listing him as a member of the Paulist community after making his first promise as Father Eric Andrews, president of the Paulist Fathers, looks on. 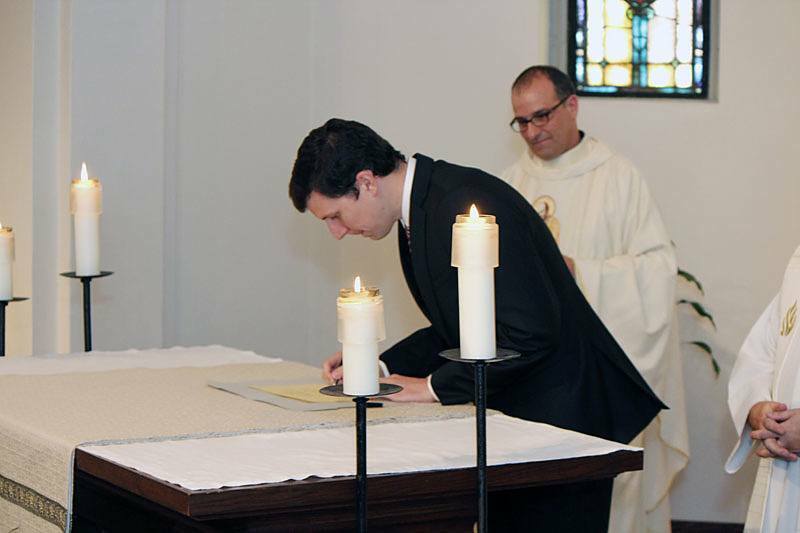 An open-minded Daniel Arthur entered the Paulist novitiate one year ago, and brought with him a willingness to trust God and the formation process. He left his work as a financial consultant and his home in Huntington Beach, Calif., for the “life changing” experience of the Paulist novitiate. During Lent, Mr. Arthur served the two Paulist parishes in Knoxville, Tenn.: Immaculate Conception Church and St. John XXIII University Parish at the University of Tennessee. The Lenten apostolate gives novices a chance to experience parish life, the responsibilities of priesthood and continue discernment of their vocation. 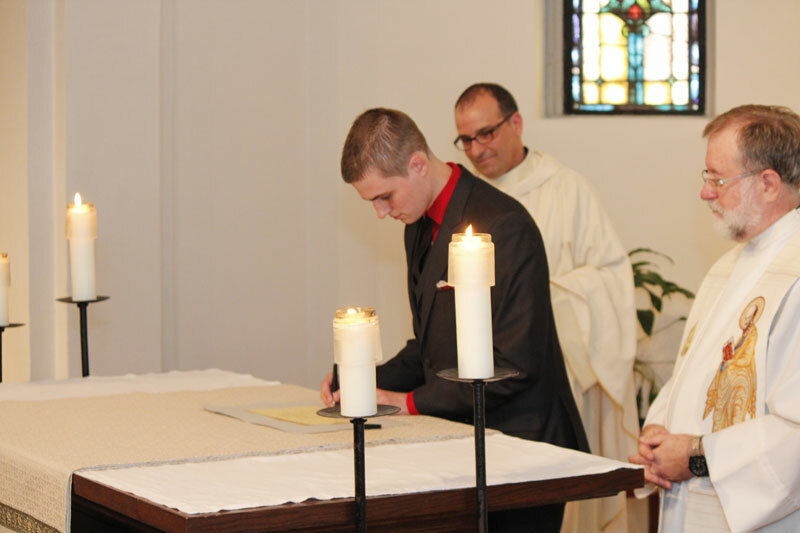 “My daily responsibilities consisted of being present and participating in all liturgical celebrations, learning about campus and parish ministry, and learning how to work with parish staff,” said Mr. Arthur of his “first look” in to the daily responsibilities of being a priest. Michael Cruickshank, CSP, signs the book that lists him as a member of the Paulist community after making his first promise as Paulist President Father Eric Andrews and Paulist Novicemaster Father Rich Colgan look on. Being accepted by and living in the Paulist community were on the mind of 32-year-old Michael Cruickshank when he entered the novitiate. 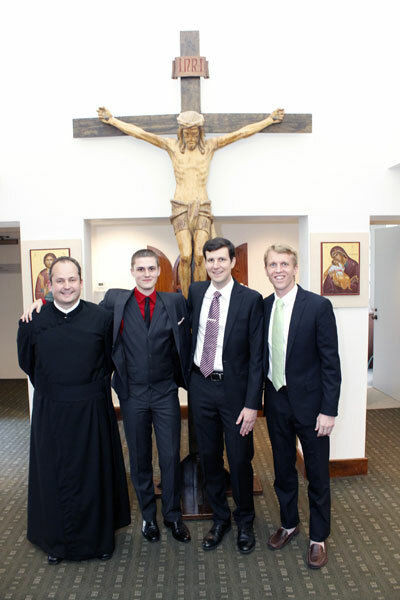 The novitiate experience seemed “to have touched upon every part of priestly life, and it certainly seems like quite a ride,” Mr. Cruickshank said. Mr. Cruickshank got a dose of parish life during his Lenten apostolate, which he served at St. Philip Neri in Portland, Ore. At St. Philip Neri, he got to participate in Masses, facilitate faith-sharing events and engage in parish life. “The experience allowed me to view parish life from inside the rectory, and I also witnessed community living in a small setting, which involves even more support and care for each other,” Mr. Cruickshank said. After a year of discernment, education and community living, “putting CSP at the end of my name is still a little surreal to me,” said Mr. Cruickshank. “But it’s a great feeling to be a part of something that’s quite important to me, and that is building the Kingdom of God. I look forward to doing just that in the Paulist way in the years to come. Evan Cummings, CSP, signs the book that lists him as a member of the Paulist community after making his first promise as Paulist President Father Eric Andrews and Paulist Novicemaster Father Rich Colgan look on. The novitiate experience was full of pleasant surprises for 23-year-old Evan Cummings. Mr. Cummings served his Lenten apostolate at St. Austin Church in Austin, Texas. 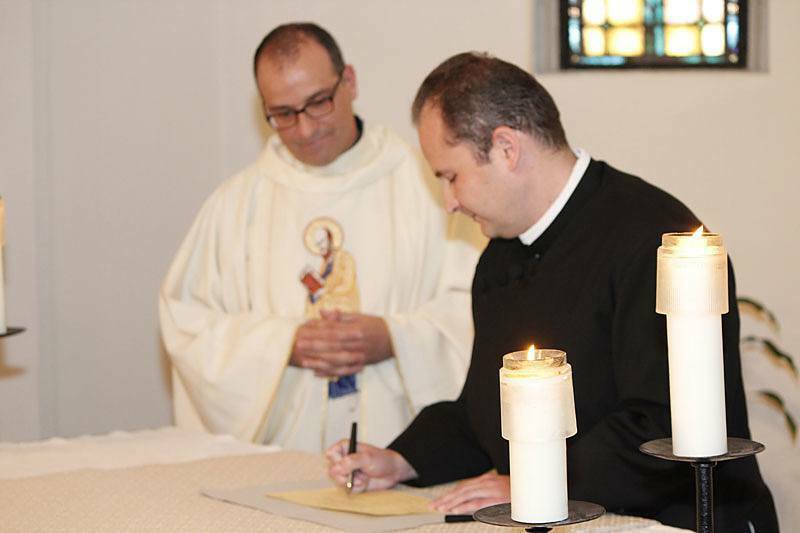 Paolo Puccini, CSP signs the book that lists him as a member of the community after he made his first promise with the Paulists. The opportunity to witness and participate in community life with veteran priests during the novitiate has been “amazing” for Paolo Puccini,” who hails from Houston, Texas. 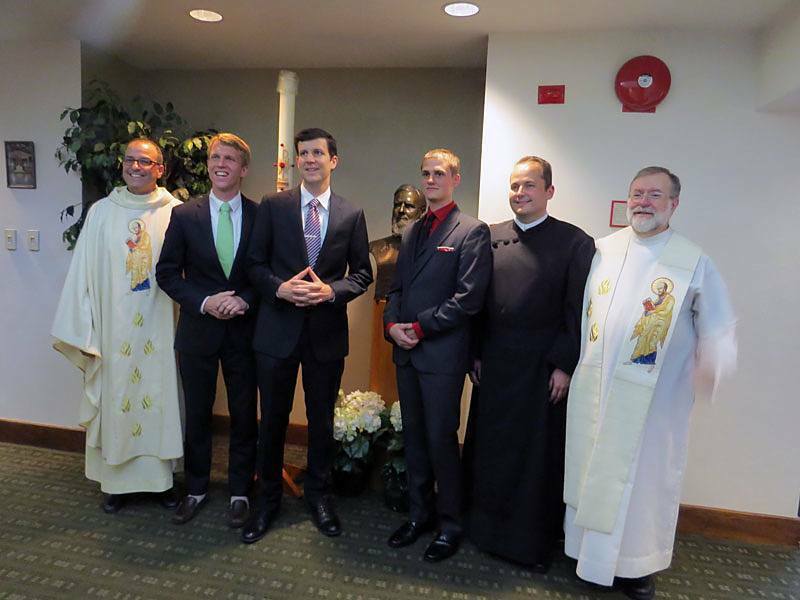 The faith community at the St. Thomas More Newman Center at The Ohio State University in Columbus welcomed Mr. Puccini for his Lenten apostolate. Mr. Puccini got a behind-the-scenes look at the pastoral and administrative workings of the Newman Center, helped plan liturgies, attended student fellowship and faith-sharing events, and engaged in some of the student and resident community ministries. And now after a year of exploring the Paulist community, Mr. Puccini is read to reciprocate the gifts he has received during his novitiate experience. “The Paulists have graciously hosted me as a novice over the past year, so I view the promise as a opportunity to begin giving back to the society through fully participating in community life as I continue discerning the calling to ordained ministry,” he said.